1. Mercury is the smallest planet in the Solar System. 2. The orbital speed of Mercury is 47.8 km/sec (29.7 miles/sec). 3. Mercury has no atmosphere and no known satellites, perhaps because of its proximity to the Sun. 4. The diameter of Planet Mercury is 4,878 km (3,031 miles). 5. The first visit to Mercury was a flyby made by the Mariner 10 spacecraft in 1974. 6. Mercury is often identified with the Greek god Hermes, the messenger of the gods in Roman mythology. 7. Mercury orbits the sun once every 87.97 Earth Days. 8. A day, from sunrise to sunrise, on Mercury is equivalent to 176 Earth Days. 9. Mercury is the closest planet to the sun, the maximum distance from the Sun = 70 million km (43.5 million miles). 10. Mercury’s minimum distance from Earth = 77 million km (48 million miles). 11. 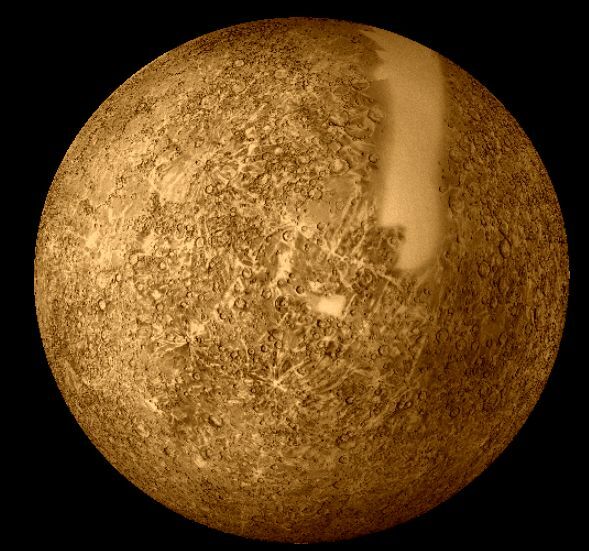 Mercury is known as a terrestrial planet consisting of about 70% metallic and 30% silicate material. 12. First it was Copernicus who noticed orbiting planet in the early 16th century; and then Galileo was the first to observe Mercury during the 17th century. 13. If you weigh 100 lbs, your weight on Mercury would be 38 lbs. (Multiply your actual weight by 0.38). 14. The surface of the planet is covered in craters much like those seen on Earth’s moon. This is a sign that Mercury has been geologically dormant for billions of years. 15. Since Mercury’s orbit is within Earth’s orbit, it can be viewed from Earth in the early morning or the late evening, but never in the middle of the nighttime. 16. The planet makes three complete rotations on its axis per every two orbital revolutions. 17. The surface temperature of Mercury ranges from -173 to 427°C. (-279 to 800°F). 18. Mercury is the second densest planet after Earth. 19. The Hubble Space Telescope cannot view Mercury. This is because Mercury is too close to the Sun and the brightness would harm the electrical components of the telescope. Earliest recorded identification of Mercury were by the Sumerians sometime in 2000 BC. Thanks. WHO DISCOVERED IT? WHEN IT WAS IT DISCOVERED? THE TEMPERATURE IN DAY&NIGHT? NUMBER OF DAYS/YEARS IT TAKES TO ROTATE ON ITS AXIS? WHAT ABOUT THAT? If a day in Mars is longer….does it mean we will live longer in mars than on earth? …why arent we there yet? Imagine if people want to live there they have to build very special shelter with sun prevention because it can cause skin cancer lol. By the way, it’s beautiful I like saturn more. i have a science project about Mercury, that is the only reason I am on this website.